Built as an immigrant hotel and saloon in the 1850s, the Historic Washington House lays claim to inventing the ice cream sundae. Around 1881, they dished up ice cream and chocolate sauce, but only in sodas. One customer started asking for a dish of ice cream topped with the sauce and they began selling it that way, but only on Sundays. Shortly thereafter, a 10-year-old girl requested a dish of ice cream with “that stuff on top” on a different day of the week, suggesting they could “pretend” it was Sunday. 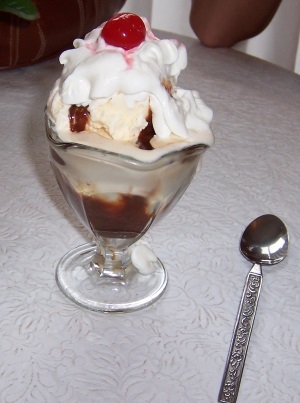 Between that and the long canoe-shaped dishes in which the ice cream was served being known as “sundae dishes,” the ice cream sundae was born. Today, the Washington House serves up sundaes but also history, with seven rooms and an old ballroom to explore, filled with items of interest from military to 19th century doctors’ and dentists’ offices to historic knick-knacks. The building itself is well-preserved and even has its original decorative tin ceiling. The ice cream parlor is a must of course, so order one up and dig in! There are 18 different sundae flavors to choose from. The Washington House is open seven days a week from 9am until 5pm (summer hours ’til 9pm). You’ll find it one block east of Highway 42 in downtown Two Rivers, right near the ends of Highways 147 and 310.